The median price of single-family homes sold in King County in December jumped 15 percent over the year to a new record of $508,000. Climbing prices and scarce listings are encouraging buyers and sellers to try some new approaches. King County’s housing market hit two milestones in December: The median single-family home price set a new high, $508,000, topping the $481,000 peak reached in July 2007 before prices began their long slide. And the number of active listings of houses and condominiums — just 2,196 — hit the lowest monthly level since at least 1993, according to data from the Northwest Multiple Listing Service. For sellers, it’s a dream. For buyers, it’s a nightmare. And for sellers who want to buy their next home, it’s complicated. The desperation for listings is so great that it’s encouraging some to go off the beaten path to get deals. For example, Faira, a new Kirkland technology firm started by former eBay and Microsoft veterans, is free for sellers and charges buyers only a 0.5 percent fee. Its chief executive even penned a sincere offer to Zillow CEO Spencer Rascoff to help sell his Madison Park home. Mike Chaffee, a John L. Scott broker in Issaquah, uses the personal touch. At homes not on the market, he drops off a handwritten solicitation with a photo of his buyer and $5 Starbucks gift card. The kicker: The whole transaction costs the seller half the typical 6 percent commission. Such off-market home sales represent a shadow inventory: Chaffee says one-third of the roughly 60 homes he helped sell last year were not listed on the MLS. He guesses that about 10 percent of homes sold by other agents are off-market deals. Or a lot more. Last year’s bidding wars resulted in homes in popular neighborhoods selling for premiums that shocked even brokers. There was a three-bedroom home in north Ballard that sold for $640 a square foot. A Montlake house listed for $880,000 sold for $1.6 million. November’s $11.2 million sale of a Hunts Point waterfront mansion appeared to be the highest price among homes sold in King County last year. According to media reports, the buyer was a senior Microsoft executive who helped lead its cloud platform. Surrounding counties also saw robust gains: The median price in Snohomish County was $358,000, up 8 percent; in Pierce County, $252,500, up 11 percent; and in Kitsap, $269,950, up 15 percent. Across the region, however, there continue to be large discrepancies in home prices and market dynamics. 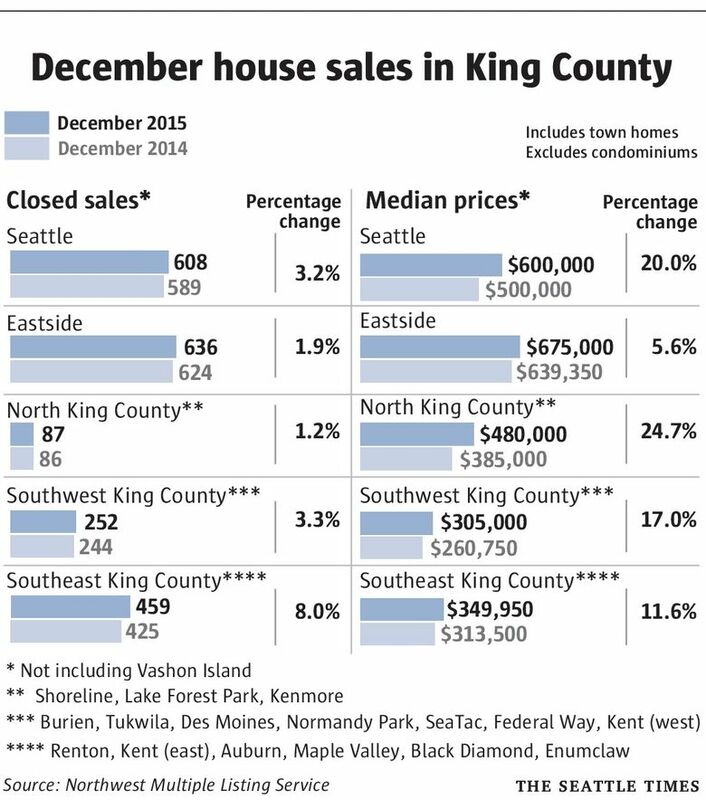 On the Eastside, the most expensive submarket in King County, the median price of single-family homes sold in December was $675,000, up a relatively small 6 percent over the year. In Seattle, the median price rose 20 percent over the year to $600,000. 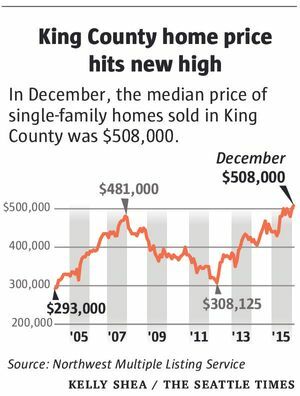 North King County saw its median price jump 25 percent over the year to $480,000. Demand was red-hot in the latter two areas, with less than half a month’s supply of listings, according to the MLS. Moreover, newly constructed homes skew the median price higher. While the median single-family home price in those pricier submarkets has recovered the ground lost in the past recession, some homeowners in large swaths of South King County remain underwater. Their mortgage debt is greater than their home’s value. In seven South King County areas, median prices are still more than 10 percent off their peak in the last cycle, according to a Seattle Times analysis of MLS data. But they seem to be moving in the right direction: In Southwest King County, the median price rose 17 percent over the year to $305,000. 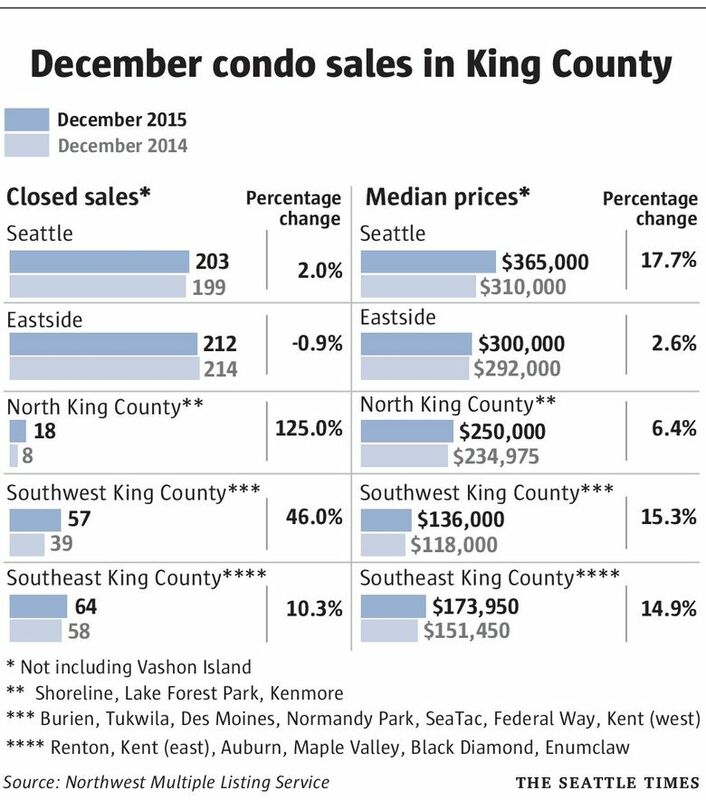 The median price in Southeast King County was $349,950, a 12 percent gain. Condominium prices also rose in December. In King County, the median sale price was $279,975, up 8 percent over the year, and in Snohomish County, it was $256,995, up 7 percent. Still, the condominium market outside downtown Seattle, the Central District and downtown Bellevue hasn’t recovered fully from the bursting of the housing bubble. In many submarkets, median condo prices are still more than 20 percent off the previous peak. As home prices rose, many experts had expected listings to increase from their current historic lows. But even discount brokers like MLS4owners.com report listings are a fraction of what they were five years ago. Some chalk the shortage up to homeowners scared that they can’t afford to buy another home, especially if they’re financing it with a higher-interest rate mortgage. But Eric Dallas, a mortgage officer at Priority Lending in Bellevue, says the gradual rise in rates has only slightly hurt purchasing power. Moreover, he said, the loan limit for conventional and Federal Housing Administration mortgages on single-family homes in the Seattle area has risen from $517,500 to $540,500 this year. Chaffee, the Issaquah broker, said he recently had an off-market deal unwind: The sellers accepted an offer and reneged on it two days later because they were scared they wouldn’t find a new house to buy in the Clyde Hill or Medina neighborhoods. According to Seattle-based Redfin, King and Snohomish counties in November had 1.5 months of supply — the second lowest of 61 metros nationwide, just behind Oakland, Calif.
“I was talking to some sellers who were considering putting their home on the market (and buying another), but after spending money on several pre-inspections and losing out in multiple bidding wars with 10 to 15 other buyers, they decided to stay put,” Redfin agent Sabrina Booth said in a company email. Carrie Nilsen owned a bright, modern three-bedroom home in Lynnwood and listed it last August after she bought a seven-acre farm in Snohomish. Her full-service agent was having trouble selling it and began pushing the family to do a short sale. “We expected a bidding war, but after six weeks were stretched thin financially,” Nilsen said. Nilsen hired Faira, a new online platform launched last summer by CEO Kamal Jain and two friends. The firm, which has raised more than $1.3 million in capital, touts itself as an Uber for real estate: It works through a network of independent contractors and collects no money from the seller — just a 0.5 percent fee from the buyer. The home-selling service, which is not widely known, has sold six homes so far and has two pending. Faira posts competing offers and inspection and title reports on its listings so that buyers can be fully informed before they make an offer. If an offer is accepted, the buyer has five days for due diligence before going to contract. Unlike a typical sale, Faira doesn’t collect any earnest money deposit from the buyer. That’s because the contract lacks traditional contingencies that give buyers a chance to get out of a deal or renegotiate the price. Such contingencies expose sellers to the risk of having to put the home back on the market. As long as the housing market remains tight, buyers and sellers will find new ways to connect and fuel new startups for bringing them together. “In the more desirable areas, people are getting really creative now,” Chaffee said.